Ericsson first entered the Volvo Ocean Race in April 2005, but now its journey has drawn to a close. The team's victory in the Volvo Ocean Race 2008-2009 is the perfect closing chapter to the company's involvement in the globe-girdling race. After having attained overall victory and great business-to-business success, Ericsson has decided not to participate in the 2011-12 edition. The decision was not easy for Ericsson, since the race has served us extremely well and the feedback from our customers is great. But we achieved everything we hoped for and thus it is now natural to pause and seek out new opportunities. Ericsson has built its global reputation on the core values of respect, professionalism and perseverance. The results achieved by Ericsson Racing Team both off shore and on shore truly reflect these values. There are many people, partners and colleagues around the world that contributed to our success, too many to mention here. 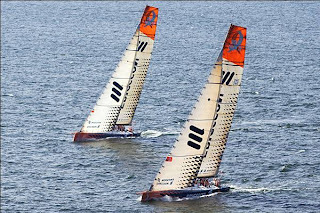 Ericsson Racing Team is champion of the Volvo Ocean Race 2008-09 due to their professionalism and dedication. To everyone involved we say thank you!